Lazy Budget Chef: How to Make Vodka Watermelon - Everything You Need to Know Guide! 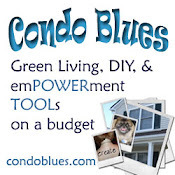 Watermelon – Some folks swear you need to use a seedless watermelon. Others say to use a watermelon with seeds because they leave air pockets for the vodka to fill. Let what’s available be your guide. 1 cup to 12 ounces of Vodka – How much you need depends upon the size of your melon and how boozy you want the watermelon to taste. 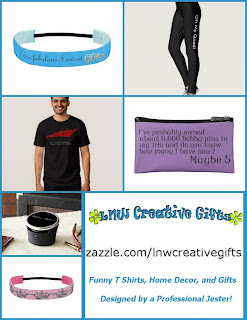 Use your favorite brand. 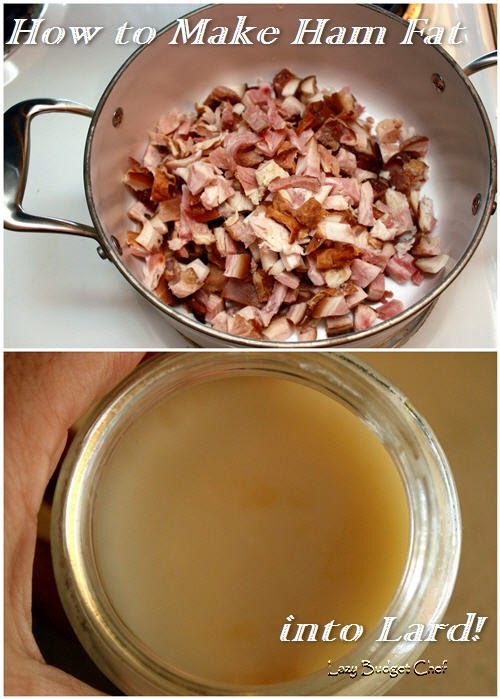 Funnel – I am using a canning funnel in this tutorial. It is one of the most useful and versatile tools in my kitchen. One day, I might actually use it when canning food. 1. Optional: To make your life easier, either put the watermelon in a small bowl, etc. or make a small slice with the knife to make a flat bottom so the watermelon will not roll around like a drunken watermelon if you like. 2. Use the knife to either cut the top off of the watermelon OR cut a plug from the side of the watermelon. Save this part for a later step. Warning: I’d error on the side of caution and use less vodka starting with 1 cup of vodka for a small watermelon otherwise you may end up biting into pure vodka. 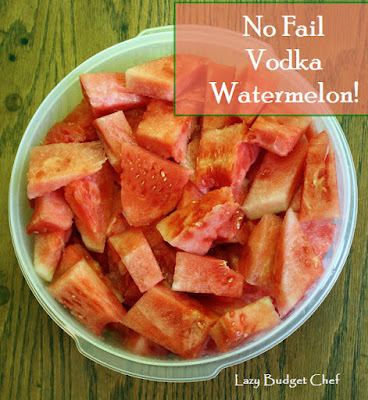 In other words, pouring this entire bottle of vodka into the small watermelon shown here is waaaay too much vodka! Don’t do this! It is not as tasty or fun as it sounds. 4. 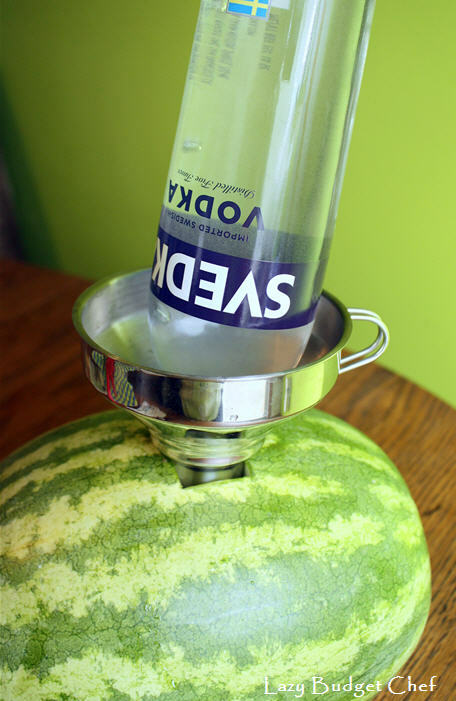 Put the top or plug back into the watermelon once the watermelon has absorbed the vodka. This could take anywhere from an hour or many more depending upon how density and juiciness of the watermelon. Try cutting a second plug hole in the watermelon to release the vacuum the funnel/vodka bottle may have created. Your watermelon may already have too much juice which is preventing the new liquid from being absorbed by the watermelon meat. You can try to drain the juice out of the watermelon by tipping it upside down (this never removes enough watermelon juice for me) or using a meat marinade injector. Some people skip using a knife and use a meat marinade injector to infuse the watermelon with vodka. 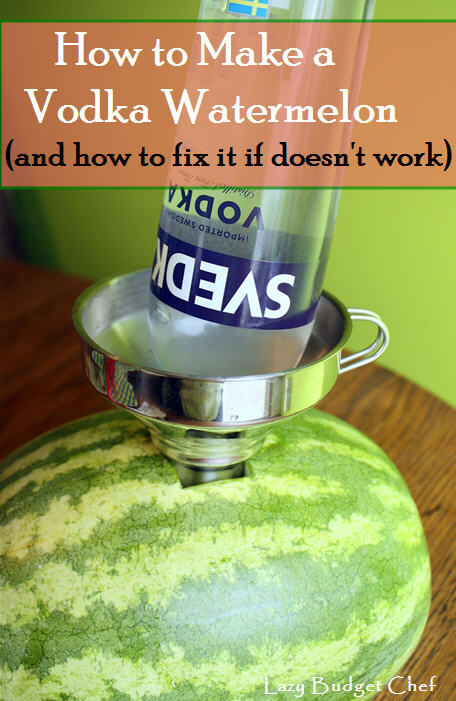 You can try using a watermelon that has seeds so there are air pockets for the vodka to flow into. You can try stabbing into chunks and/or scooping watermelon flesh out of watermelon to make room for the vodka through the sliced top or plug hole. 5. Allow the watermelon to sit and infuse anywhere from 24 hours to several days. Periodically rotating the watermelon will encourage the vodka to infuse more than one spot in the watermelon. Use the easiest way to make a vodka watermelon come out perfectly every time. Slice, cut, make melon balls, etc. 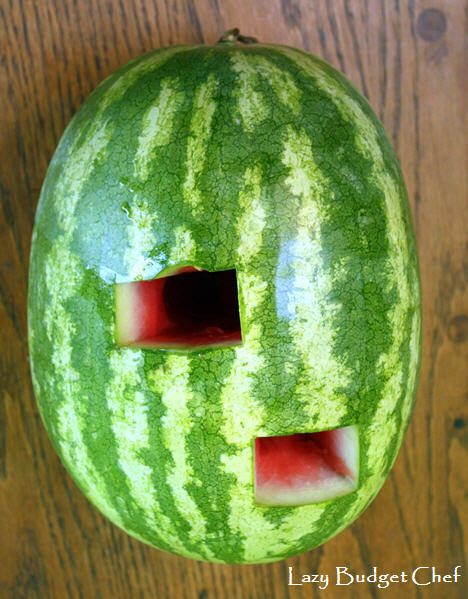 the watermelon as you normally do. 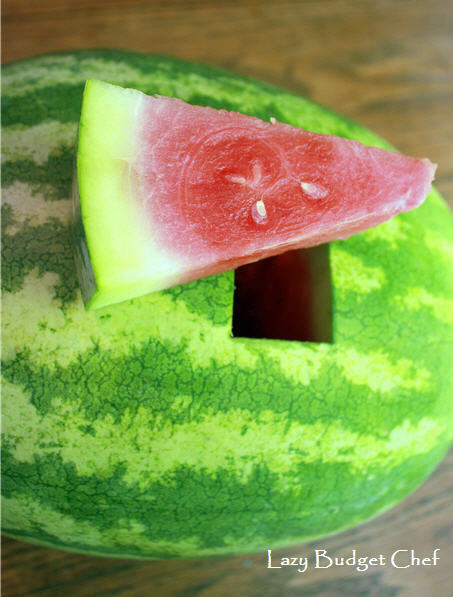 Put the sliced watermelon into a container with a leak proof lid. I use a cake carrier similar to this one. Pour a cup of vodka over the watermelon slices. Snap the lid on the container. Rotate the container every few hours until the watermelon slices absorb the vodka completely. Insert a tap into the watermelon according to the direction on the Watermelon keg tapping kit.